Shawn is still looking for this lamb. I am looking for a lamb made by Blankets and Beyond, I believe in Canada. We are looking for the lamb, or sheep, only. It doesn’t have to be with the blanket. It has a brown face and hooves, with a white woolly body. Our daughter used to have the lamb she called Babs. It was her security at bedtime and naptimes. She still looks for Babs when it is time to go to sleep. I have been looking everywhere when I came across your website. We are very happy with any help you can give us. 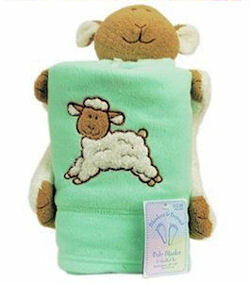 If you can help Shawn find this Blankets and Beyond Brown and White Woolly Lamb, THIS SITE IS NO LONGER ACTIVELY MANAGED. Please use Our FREE FACEBOOK GROUP, including #072208-3 in the subject, . 310069519514 – it’s just the face though. This is the security blanket version combines the head of plush and decorative portion of blanket. May help while the search continues. Multiples listed here is one. thanks for all your help! I picked up the last one mentioned on ebay as a very close replacement. Again thank you. and we are still going to be looking! What is the size of the lamb? I think I have one in a bin somewhere but if I remember right, it’s pretty small. I found it. It measures about 6 inches long and has unusually long arms and legs which makes me think it might be the right one as they look like they may have been wrapped around something. I will list it on Ebay tomorrow. Believe this is the lamb. I found it. It measures about 8 inches long and has unusually long arms and legs which makes me think it might be the right one as they look like they may have been wrapped around something. I will list it on Ebay tomorrow. Thanks, Blanket Co. I don’t think that is it, but it’s on eBay at 330815831999, just in case.